In soccer, the ability to anticipate the arrival of teammates’ passes, receive the ball, and quickly and accurately redirect it is essential to executing a game plan. But it can be difficult for individual players to develop and measure these skills without multiple players to simulate game scenarios while training. Working with Northwestern’s men’s soccer team, an undergraduate student group in the Segal Design Institute’s Design 384: Interdisciplinary Design Projects course has developed a portable, cost-effective alternative, called Assists, that may soon become a common part of training for Northwestern’s soccer program. 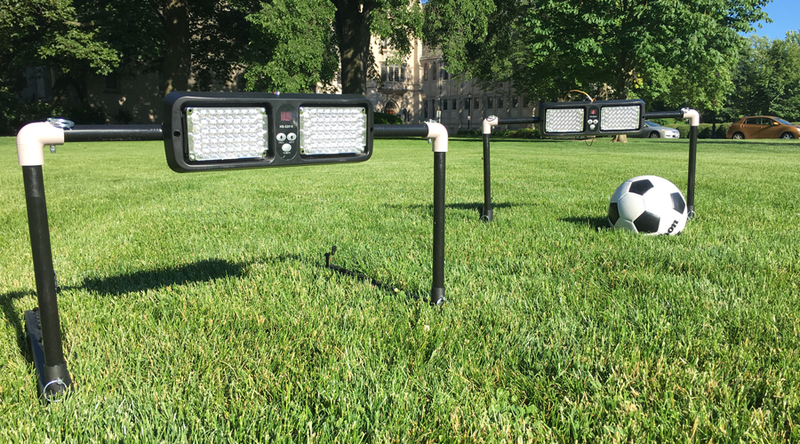 Costing under $500 to produce, the system combines four small soccer-style goals, LED lights, and an electronics system to create a 360-degree training environment at a fraction of the cost of professional trainers. Assists uses soccer-style goals, LED lights, and an electronics system to simulate professional passing trainers. To operate Assists, a player stands in the middle of a circular arrangement of the goals, placed approximately 20 feet apart. The player then launches the iPhone app, which signals to an automatic ball feeder to send a ball to the player while simultaneously activating a red light on top of one goals, chosen at random. The player then receives the pass from the feeder, locates the lit goal, and kicks the ball through as quickly as they can. After the drill ends, data on the number of scores and the time it took for the ball to pass through the target is sent from the goals to the app so players can assess their performance. The team’s inspiration for Assists came from the Footbonaut, a million-dollar training facility in Germany that places players in the center of a robotic cage, where they receive and redirect passes from a ball feeder to dozens of surrounding sensor-enhanced targets. Data from each training session is collected and analyzed, allowing coaches and players to evaluate performance progress over time. 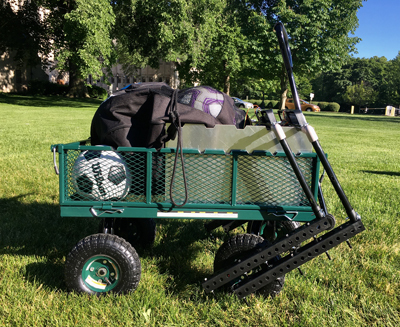 To develop a system that was portable enough to be packed and moved in a wagon while maintaining similar functionality to the Footbonaut, the team leveraged their interdisciplinary backgrounds in product design, mechanical engineering, electronics, and computer science to overcome design challenges. The team tested the first-generation prototype of the Assists system in the spring with members of the Northwestern men’s soccer team. Assistant coach Rich Nassif hopes to make Assists available to his players to train with during the team’s summer off-season, a time when there are limits on organized team activities. In the future, new students may join the project to develop additional features, including an enhanced electronics system that transfers the collected data to a website for easier analysis.